We specialise in House, Factory and Church Roofs. Waterjet cleaning to roofs, walls and paving. Fungicide treatment - low cost maintenance service, will keep roof continually clean, regular treatments every 2 years as necessary. Roof spray-painted 10 standard colours. Colour matching is available. Leaks repaired when roof is cleaned. Specialist in rope access and all building exterior cleaning. Isn't the roof cleaning operation a rather messy job? I have a pool in my garden, won't that get dirty? No, we have large plastic sheeting which will be used to cover the pool. Will the job be cheaper if I only do the cleaning and not the fungicide treatment? No this is because the fungicide is an integral part of the job. Fungus will start to regrow within six months if not treated. Why do you spray and not brush apply the roof paint? Do you only do roof cleaning and painting? 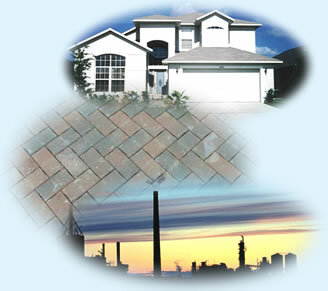 No, our services also include Painting and Waterproofing to the Domestic, Commercial and Industrial markets.